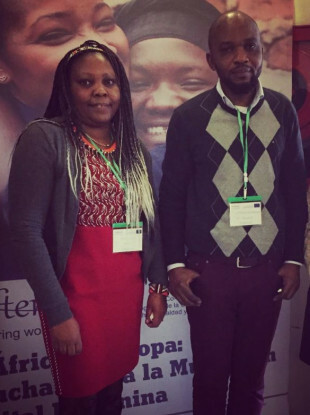 Naomi Manu, Cork-based Champion for Change, and Rodrigue Bukungu, men's group facilitator, representing ActionAid Ireland at a conference about FGM in Toledo, Spain, last month. THOUSANDS OF GIRLS in Ireland are believed to be at risk of female genital mutilation (FGM). FGM refers to the ritual cutting or removal of some or all of the external female genitalia for non-medical reasons. The practice is most common in Africa, Asia and the Middle East, and carried out due to cultural or religious traditions. At least 200 million girls and women in 30 countries worldwide have undergone the dangerous procedure. Using data from the 2016 Census, it is estimated that 5,790 women and girls living in Ireland have been subjected to the practice, compared with some 3,780 in 2013 – a 53% increase. A further 2,700 girls here may be at risk of undergoing the practice, according to research by ActionAid. FGM was outlawed in Ireland in 2012. As of January, no one has ever been convicted of carrying it out. ActionAid Ireland took part in the AFTER – Against Female Genital Mutilation/Cutting Through Empowerment and Rejection – project, a two-year programme that was funded by the European Union and aims to eliminate FGM. As part of this initiative, the NGO ran a pilot programme in Cork to raise awareness among migrant women and men about the dangers of FGM. Some participants said the initiative changed their opinion of what they had previously regarded as a normalised practice, and that they now have the confidence to reject it. Separate classes were held for men, women and children. Nathalie Mehmood took part in the course held in the Direct Provision centre in Kinsale. Mehmood, 50, is South African and has been living in Ireland with her daughters, aged 15 and 10, for two years. “I’m a mother of two daughters, so naturally [the course] peaked my interest,” Mehmood told TheJournal.ie. She said she wanted to learn more about the practice, but never agreed with it. “I had some insight into it, but wanted to learn more about it. FGM is not extensively practiced in South Africa, probably more so in remote areas of the country. People don’t speak about it unless a victim of this heinous crime speaks out and makes it known. Mehmood said about eight women started the course but over 20 people ended up attending as word about it spread. She said a small number of the participants initially agreed with FGM as it was part of their culture but changed their minds during the course. Other women had been subjected to the practice themselves. “A few people had actually been through the process and had a greater understanding of what had happened to them (after the course), Mehmood said. Her daughters attended a weekly empowerment group at the centre, where girls were introduced to FGM but did not discuss it as extensively as the adults. “It was really a great help for them too, to have been introduced to it in the manner that they were,” she said. Separate classes about FGM were also held for men at the centre and elsewhere in Cork. “It’s incredibly important for them to know about the practice so they can see how it impacts them negatively as well. “We should be speaking to both sexes because if we only talk to women it’s like clapping with one hand, if I could use that expression. It’s senseless to do it for one group only and not the other,” Mehmood said. As much as we need the support of each other as females, we needs the support of males as well. Rodrigue Bukungu Nkwayaya, who facilitated the men’s group, said some of the participants were initially reluctant to discuss FGM as it’s seen as “a women’s issue”. However, they became more comfortable with the topic over time. Bukungu Nkwayaya said the participants were from various countries including Zimbabwe, Eritrea, Nigeria, Tanzania and Somalia. He said that while the topic was “a cultural issue” for many of the men “they were happy to say [FGM] was against human rights by the end of the course”. “In the countries where FGM is taking place, men often won’t marry a woman who hasn’t undergone FGM,” he said, adding that the training helped men to fight FGM by sharing what they’ve learned with other men, including those in their home countries. We need them to send the message back home via WhatsApp groups or social media. In short, we are supporting women to fight FGM. Bukungu Nkwayaya said he hopes funding will be made available for similar courses to be run elsewhere in the country. The AFTER programme has now concluded, but ActionAid is currently seeking funding to continue its work in this area. The organisation wants to hold workshops for four more groups (women, men, girls and boys) over the course of 2018. In the same way as the previous project, this work will be informed by successful approaches being used by ActionAid in African countries. The NGO also wants to implement a long-term countrywide programme to eradicate FGM. A National Action Plan (2016 to 2019) was developed by the National Steering Committee on FGM in Ireland but has not been endorsed by the government of Ireland. A spokesperson for ActionAid told TheJournal.ie: “We feel that the government needs to take a comprehensive approach to dealing with FGM. People who completed the Empowerment Pathway in our Cork programme are also calling for better programmes to prevent FGM and support survivors. A spokesperson for the Department of Health said Minister Simon Harris is “very clear that FGM is never, ever justifiable”. It has no place in healthcare, is illegal and dangerous, and can have a devastating impact. It is a violation of human rights. The spokesperson added that FGM “will be clearly referenced” in the second National Intercultural Health Strategy, which is currently being developed by the Health Service Executive (HSE). The HSE provides funding to AkiDwA, a national network of migrant women, which works on a number of issues including FGM. It also funds a specialist clinic operated by the Irish Family Planning Association for girls and women who have undergone FGM, and has sent a resource pack about FGM to relevant healthcare professionals. Email “How people in Cork are fighting back against FGM ”. Feedback on “How people in Cork are fighting back against FGM ”.